For the first time, the Jr. Maccabi Games featured "Taste of Maccabi" for 5-7 year olds ready to begin their Maccabi adventures. 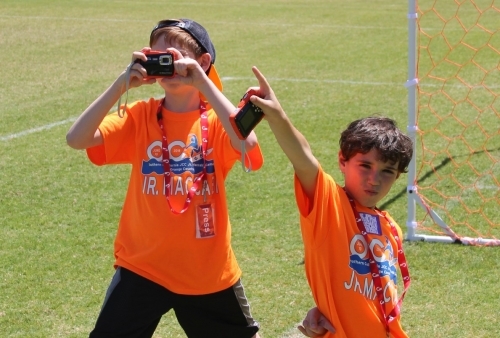 Like the Maccabi Games, our own young sports reporters report on the Maccabi experience. Our sports journalists--star reporters--make paparazzi look cool! Interviews and (most) photos by Jr. Maccabi sports journalists: Lev Gavshon, 10 years old (left), and Regan Brandt, 8 years old (right). Our busy star reporters took over 1,000 photos at Sunday's events. Click here to check out the photo gallery. In addition to the sun and fun, Lev reported the day mixed his favorite things: electronics, friends and food. Regan reported, like him, the kids enjoyed the pizza and treats and swimming. Our star reporters continued to report on the largest Jr. Maccabi southern California crowd ever. Over 170 kids, ages 5 to 12 years old, gathered to celebrate sports, arts, Jewish culture, community and fun with the ruach (spirit) nd rachmanus (sportsmanship) that are strongly aligned with the Maccabi experience. "The Merage JCC was so proud to host this event. It was a fantastic opportunity to see Jewish youth come together for a day of sport, arts, competition, and camaraderie. We are proud of all the kids who represented Southern California with dignity and true Maccabi spirit," said Sam Cohen, Associate Executive Director and Director of the 2018 JCC Maccabi Games. Teams from Westside LA, the Valley, Long Beach and San Diego traveled to OC to be a part of the Games. Jake, an 8-year old tennis player from San Diego, told our star reporters that he "wanted to experience the Maccabi Games and have fun with other Jewish kids." Ilana, a 9-year old swimmer from Team OC, she was looking forward to "doing her best". Matthew's mom, while watching her son playing soccer for Team OC, shared with our star reporters that she was "excited for her son to feel part of the Jewish community and to have fun!"